Continuing on the barnyard theme of my last post, I saw this roly poly while on assignment in the Fall Creek community of Avery county yesterday. 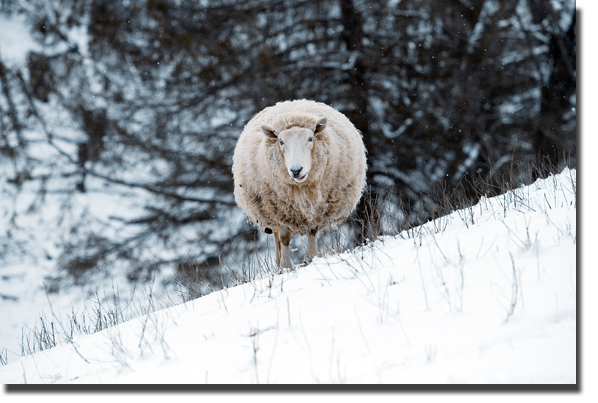 It was snowing slightly and I was making my way up a mule face of a mountain when I saw Mr. Sheep looking at me. I immediately had a 'The Hills are Alive," kind of moment where I was overcome with the feeling of running with my arms wide open towards Mr. Fluff. I briefly imagined trying to fit my arms around his body and burying my face in his softness. Alas, Mr. Squishy could read my mind and my thoughts scared him . All I got was this photo. But, he is adorable with all that wool he's been growing over the winter. Hey, I wonder if I'm this darn cute with all my winter weight?